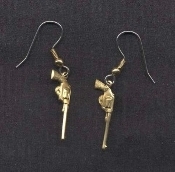 Funky Mini Vintage GUN EARRINGS - Punk Biker Cop Police Sheriff Novelty Costume Jewelry - GOLD-tone miniature metal Western style PISTOL CHARM stamped pressed brass cowboy classic shootout weapon charms, approx. 1" long x 3/8" wide. These are so cool, they'll help you get 'em out of Dodge!